My on-hand ingredient combo happened to be frozen strawberries, strawberry yogurt and Triple Sec (triple cheapo sub for Grand Marnier–orange liqueur). 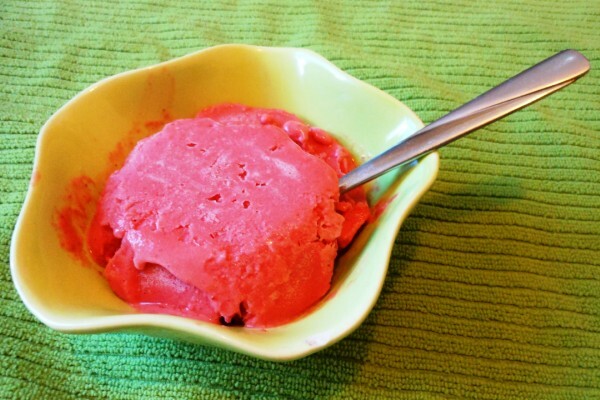 The liquor does impart a touch of flavor, but its main purpose is to keep the sorbet from freezing solid. Some among you may have noticed your booze does not freeze solid when you put it in the freezer, as you may have perhaps done to stay organized. My adaptation came out of the food processor more smoothie-like, much thinner than the recipe described, but firmed up overnight. This could be due to improper weight estimation, the different water content of different fruits, the thickness of the yogurt, the variety of alcohol used or hot kitchen weather. With that in mind, if you’re looking for a sorbet to serve in glorious rounded scoops nestled inside crystal goblets with mint leaf garnishes at a dinner party, I wouldn’t stray from the recipe as written for planning purposes. But if you’re looking to serve your friends or family a refreshing, low-sugar, low-fat fruit dessert that they might end up sipping or scooping, then this is your go-to template. Check out other variations at The Food Matters Project. Jen Cantin graduated from Clark University in 2011 with a degree in English and Journalism as well as student loans just like you hear about on the news! She shares other (a)musings at Deep Fried Epiphany and dedicates this post to food processors chuggin’ away at whatever needs processing. Combine first three ingredients in a food processor or blender and process until smooth. Add orange liqueur one tablespoon at a time, stopping when you reach the consistency you’d like. Consume immediately or freeze for a few hours or overnight a thicker product. I went with strawberries to since I had them in the freezer. So delicious! Love your honesty! Definitely a recipe worth playing around with. Lots of possibilities. Yum… Triple Sec! Great idea. I’m trying to identify good recipes to impress my mother with when we go on our family reunion next month (she’s an awesome cook) and she always has Triple Sec on hand, so must file this one away for future reference!